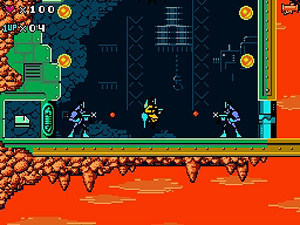 We've already seen Capcom enjoy success on WiiWare with their retro-infused Mega Man 9 release. Now it seems they're trying to show DSiWare the same retro love with Dark Void Zero. Of course now the question is, does the game live up to the lofty standards the company has already put in place with Mega Man 9? Dark Void Zero features a very simple and intuitive gameplay system. Your goal in each level is to locate the various keycards needed to unlock doors, ultimately reaching the portal code needed to progress to the next area. Of course, you're going to have to defeat a boss first. While this might sound simple, you'll quickly find out just how tough it can be, but the game allows you to choose from three difficulties to better customise the game to your skill level. 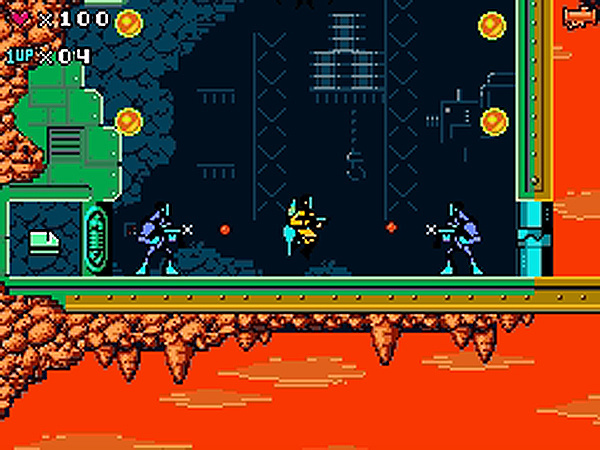 As you run around each area, you'll come up against a host of enemies trying to stand in your way. You're armed with a standard weapon, but you can also acquire secondary weapons that feature more firepower. You'll find these quite useful in shooting through some of the walls that get in your way, not to mention some of the more powerful enemies. You can also locate a jet pack that will allow you to fly and hover in the air. If it's collecting items you like, you can also pick up tech points and journal entries strung throughout each level as well. These can be a good incentive to go back and play the levels again in order to locate everything. 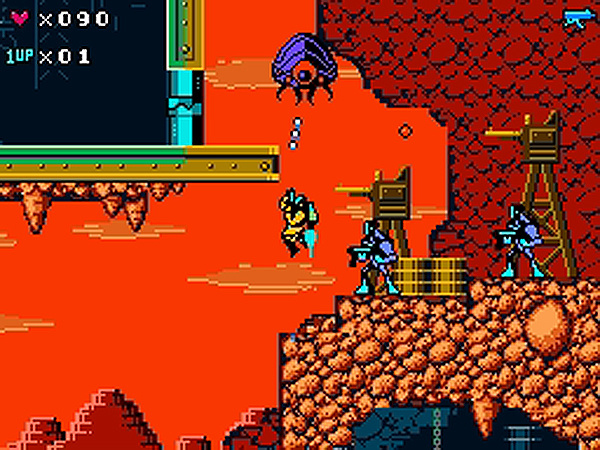 Once you've traversed each area, you'll have to match up against one of the game's foreboding bosses. If you thought the levels themselves were tough, wait until you get a load of the game's bosses. The control scheme in Dark Void Zero is extremely basic and easy to pick up. The two-button setup works well in accurately portraying the good old NES control schemes from the 8-bit era. Couple the tight controls with some extremely well-designed areas and you have an action platformer that should challenge fans of all skill levels. Even with only three levels, there's so much challenge in each area that you'll still get your money's worth out of the game, and then some. 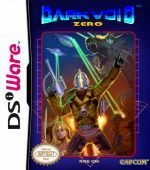 Visually, Dark Void Zero is exactly what you'd expect from a company shooting for an 8-bit NES-style visual presentation. If you didn't know better, you'd swear you were playing an old NES game, minus the heavy flickering of course. 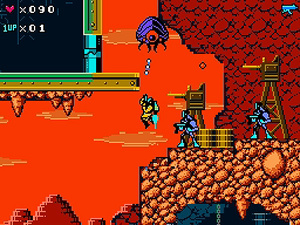 There's still enough detail in the visuals to be able to easily distinguish items you'll be searching for, and the enemies are all well-animated, probably even more so than would actually be possible on a standard NES console. Toss in some wildly vivid colour schemes and you have a very authentic 8-bit visual experience. Obviously you're going to need a good set of 8-bit chip tunes to complement your visual styling and Dark Void Zero doesn't disappoint. Not only are there some absolutely amazing retro chip tunes to enjoy, but the sound effects the game makes use of are equally authentic as well. It's clear that Capcom put in some time and effort into making sure the audio presentation matched that of the visuals and it makes for a truly incredible audio-visual experience overall. Sure the game might be a bit on the short side, but given the game's addictive gameplay and fairly high degree of difficulty, it's difficult to complain, especially considering the game will only set you back 500 Nintendo Points. If you're a fan of classic 8-bit action titles and don't mind a slightly elevated level of difficulty, this is definitely a game you'll want to add to your DSiWare collection. And if you're not a fan, this wildly enjoyable title might just make one out of you. Excellent review you've sold me the game but will we have a EU release. 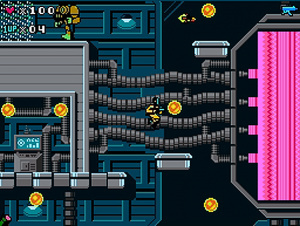 Dark Void's out on 360, PC and PS3 this Friday - the smart money is on a DSiWare release too. I think I'm actually more interested in this than either of the Megaman games for WiiWare. I can't put this game down! I haven't beaten it yet, it took me quite a few deaths to make it past level one (Contra style deaths: slow progress with each life and gained knowledge of the pattern and playing field). I bought it completely on a whim before any reviews, and I'm so glad that it turned out this good. My DSi is quickly becoming my bestest buddy ;D Buyyy itttt. The real question is, when is it coming to Japan? Youve convinced me! Finally, some more people are learning to use dsiware to its full potential! And PAL regions for that matter! Very interesting! Knowing how the HD versions turned out, this may be the Dark Void to get! Any word on it coming to Wii Ware? YES! What I've been waitin' for! Gotta get this ASAP! Great review. Very motivating indeed. Good review but wow. Dark void gets okay to bad reviews and this one gets good reviews. Interesting...this game is getting better reviews than the console release is. Great game and i love the NES retro style . Funny thing is that this tie-in is actually better than the "true" Dark Void on other consoles. This looks cool, and loving that it's on DSiWare. Any word of a European release yet? I want it. This was went completely under my radar! I will be getting this once I get home. Can't wait till it comes out in the UK! High degree of difficulty (even on easy) puts me off a bit. I will probably be still getting it anyway. It seems this game turned out to be a whole lot better than the one on the PS3 and Xbox 360. Retro gaming FTW! This will probably be the first game I download if I ever get a DSi. This game is amazing and i'm happy i got it. But there's one problem and every developer is doing it. Why have a leaderboard if you don't include an online leaderboard. This is 2010 and i believe an online leaderboard should be a standard. Nintendo SDK kits come with wifi, therefore there's no excuse. Best game yet on DSi-ware, IMO! No save feature, eh? Or am I just brain farting.. Personally I don't think Capcom deserves any downloads of this. They put this on the Dsi and the rest of the franchise on the 360 and PS3 and what about the Wii? Frak them!!! "It seems this game turned out to be a whole lot better than the one on the PS3 and Xbox 360. Retro gaming FTW!" That's good to hear, but it still doesn't justify that they're not releasing a version for the Wii. I'm beginning to be really scared for the wii's future and I don't like it. This game is so awesome, I love it! I beat it last night. it's good. But in keeping true to it's NES origin, it froze on me once while on the second level. I guess when i started i didn't blow it out enough. my first dsi download. A true piece of gaming history. it automatically saves when you beat a level, so if you quit and come back to the game you choose continue and start whatever level you reached last. There's only 3. @Corbie..... Awesome Review Man. I actually was thinking that if you did the review you would give it a 9, and correct I was lol. Great game, and really makes me miss the good ole NES 2D Days. Hopefully Capcom will see there is a market for 2D Games on DSiWare and will start supporting the service. I REALLY hope so. Just bought it and I must say it is one awesome game! I am enjoying it well worth the money and the score! How I wish I could get it. What are the controls and are the customizable? Just two buttons (A and B), just like the NES, and no you can't customize their functions. The cover looks awesomer than the whole PS3/360 game. Well this looks fun! I will have to keep it in mind when getting more DSiWare! This is the best DSiware yet! Well worth those 500 points!!! Oh and great review corbs! Remember guys, there is a PC version coming out sometime soon. I would get this, but worried about the fact there's only 3 levels. How long are the levels? Thanks in advance! Each level takes maybe 10 to 15 minutes after you get familiar with it. However, if you factor in all the trial and error, collecting all the items, getting high scores, and harder difficulty modes, each level could easily last over 2 to 3 hours. In my opinion, this game has tons of replayability. I wasn't the biggest 8-bit action game fan, but all the praise this game has received from the people who played it convinced me to buy it, and I'm happy I did. This game has definitely made me a fan of the genre. Played, beat, and loved everything about this game - except for the length. Hopefully we'll see more like it in the future. got it. Good game. It was pretty darn short, but just what I wanted. I recommend it! 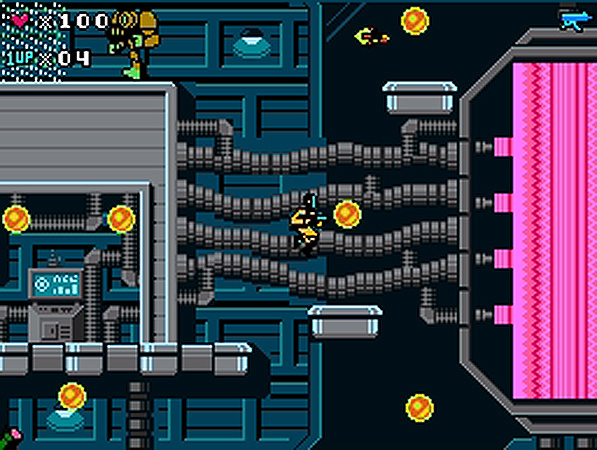 The game saves automatically, only between levels. I love this game! It quite possibly may be the best game available for DSiWare currently. Well worth the 500 pts! I agree with others who say it is too short...but really, as good as this game is, complaining about the length is just nit-picking. Congrats Capcom...and Thank You! I have the demo of the console Dark Void on my PS3, and I love replaying it a lot (I should play the whole game instead, maybe rent it). But Dark Void Zero is waaaaaaaay better because of its awesome retro-ness. Keep em coming Capcom! 3 levels is short. But I'd rather have 3 levels of a great game rather than 8 levels of a mediocre one. We need more 8-bit retro games from CAPCOM and everyone else. And It's hard, too. Bonus! Vintage, polished, well designed levels, entertaining, pretty hard. A must have. There is an iPhone/iTouch version out now. No word on if it controls decently, but it's only $3. A 9/10! Looks like this is a definite buy! These is really the best paltformer ever, it is a MUST buy.